This is the Bubbers King. My Mom let me take over the blogging reins today to tell you about my super exciting day yesterday. I peeked outside and Ka-BLAM! 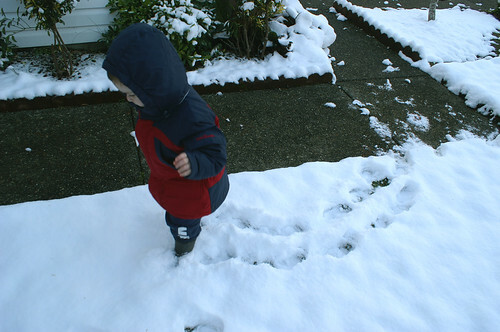 This isn’t the first time I’ve seen snow, but the first time I saw snow, I was only 9 months old and a little confused about this whole winter thing. 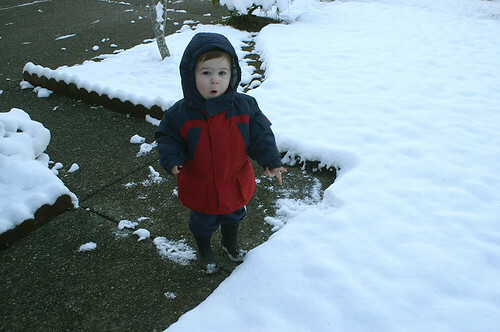 Then later, I saw snow again but I was only 12 months old and not very impressed, since it was supposed to be spring. 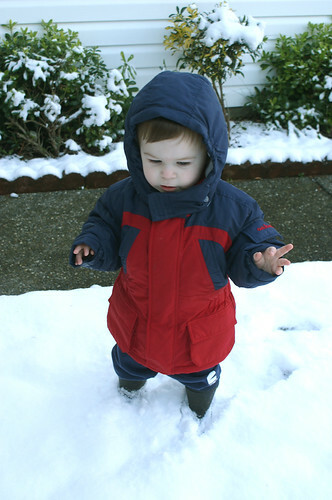 But now, I’m such a big boy that I love the snow. And the snow loves me. 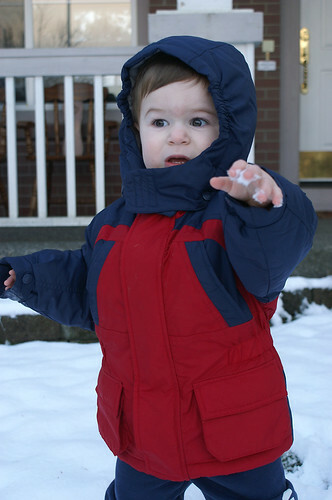 And I wanted oh-so badly to poke the snow when Mommy opened the back door and showed me how she could poke it. But when I hunkered down to poke it, I got cold feet and just froze and stared. And since it was time to go to church, Mommy said we couldn’t wait for me to work up the courage to poke it. “Yes, really,” she smiled and then led the way. I followed her until we reached….. Carefully, I extended one foot and tested it out to make sure it was safe. Then I shifted my weight onto the test leg to see if it would hold. And then I took off!! 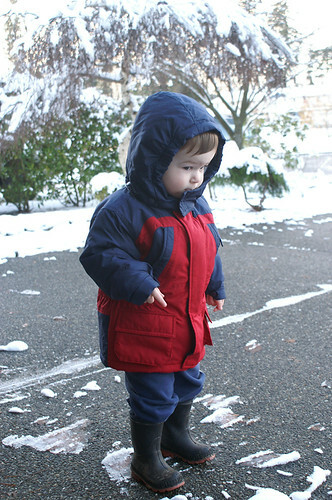 And before I knew it, my boots were covered in snow! And a cute little track of Wooga prints trailed behind me! 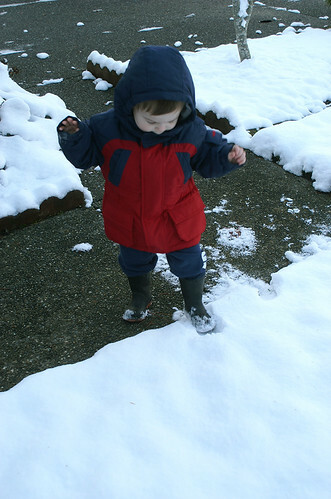 And then I reached down and poked the snow! And let me tell you, it was cold. So I wiped it off. And then I asked Mommy to see a bus. Very cute, bubbers! You should come visit us – we have lots of “no” for you to test out! 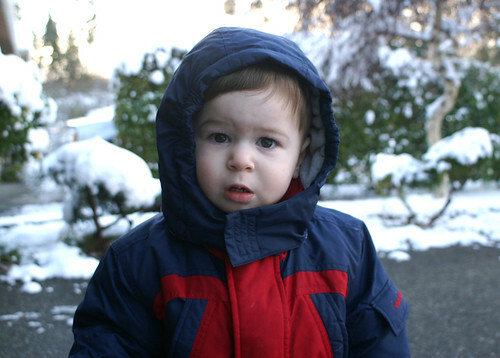 i love it when bubbers takes over here … he’s so eloquent and the photographer isn’t so bad either! too cute!! How cute. We’ve finally started getting winter snow all this week (a little late here) and Elora and Josh both have bad colds, so they can’t go out. They’ve been VERY disappointed. 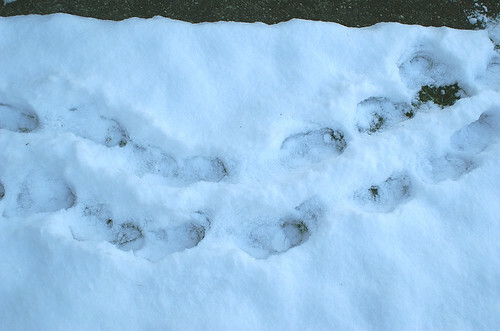 Aren’t those the cutest little bubbers foot prints? I love them covered in snow. Too cute! “No” is so much fun! My kids have been enjoying it, and mommy is trying to stay warm! Hope to see you guys outside soon, maybe when this freezing rain stops! Love it! Snow to bus in 2 seconds flat!!! 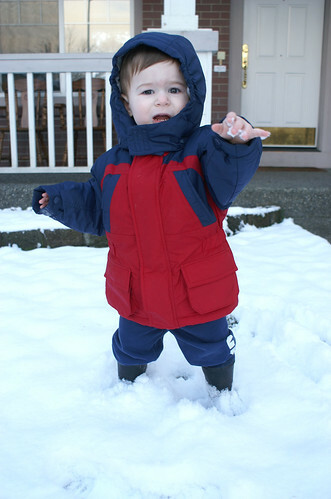 I love it when kids discover snow. 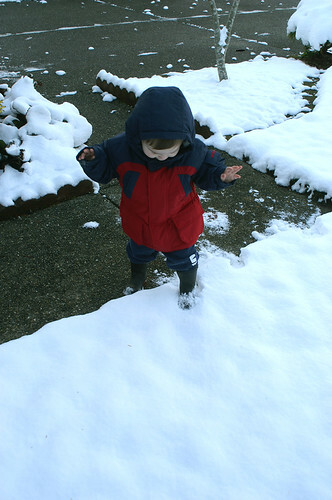 Our granddaughter from Texas was 3yrs old when she came to visit for Christmas and it snowed. It was so fun to watch her.. Cute pictures as always. I love the previous post about the quiet night. I really miss the snow in Utah. My favorite thing to do was to go out and shovel the driveway at night or early in the morning after it snowed. It was always so quiet and sooooo beautiful. I wish I had taken pictures. The Mr and I would sit on our bench on the porch and just watch. I would rather shovel than use the snowblower. I didn’t realize at first why he kept saying NO! I’m a little slow apparently. Then in the car after I read this, Clara was pointing out the window and yelling… NO, NO! Oh, so that’s what he was saying. “Snow” how cute! It’s amazing that Bubbers can write stories like that, but then he’s been making comments on cards to us since birth! 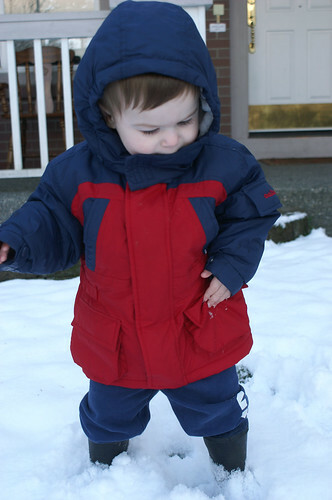 Loved enjoying his first real fun in the snow.